According to the citation, the Crown Prince provided "outstanding support for reinvigorating Pak-Saudi bilateral relationship"
Pakistan Monday conferred its highest civilian award Nishan-e-Pakistan on Saudi Crown Prince Mohammad bin Salman for his "outstanding support" in reinvigorating the ties between the two countries. The award was presented by Pakistan President Arif Alvi at a special ceremony held at the President House in Islamabad. Pakistan Prime Minister Imran Khan, members of prince Salman's delegation, diplomats, senior officers and Cabinet ministers attended the ceremony. According to the citation, the Crown Prince provided "outstanding support for reinvigorating Pak-Saudi bilateral relationship". The Crown Prince arrived at the President House in traditional Presidential chariot along with Prime Minister Khan. A special contingent of Presidential security guards escorted the chariot. President Alvi, Foreign Minister Shah Mehmood Qureshi and Information Minister Fawad Chaudhry received him on arrival. "Saudi Arabia and Pakistan have been indispensable partners for a very long time. We have been together for centuries. Our friendship is bound in religion and culture," Alvi said. "Even though there is geographical distance between us but we are very close in our hearts. The recent visit of the prime minister and your visit has cemented the friendship between us," he said. The President also hosted a luncheon for the royal guest. A formal meeting was held between the President and the Crown Prince, along with their respective delegations. The two sides expressed desire to further promote and deepen the bilateral ties. "I was honoured to meet the president of Pakistan. I thank you for honouring me with Pakistan's highest award," prince Salman said in his address. "The brotherly relationship between the kingdom and Pakistan focus on the principle of Islamic solidarity. It is a model to be emulated by other nations. Our (countries' relations) go back 67 years that witnessed continuous development that rendered itself beneficial for both countries. "The founding fathers for both countries established these relations on the principles of truthfulness, common understanding and mutual respect that go back to the first days of the establishment of Pakistan, post-World War II," he said. Earlier, the Saudi prince also met a joint parliamentary delegation of all parties and discussed various matters of interest. 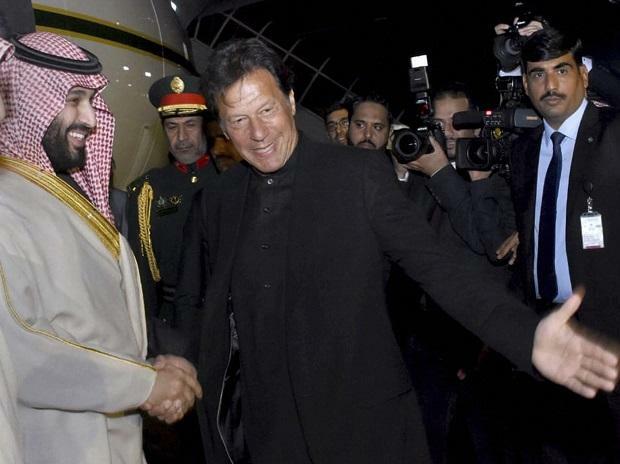 Prince Salman arrived in Pakistan on Sunday amid heightened security and arrangements in Islamabad and Rawalpindi.